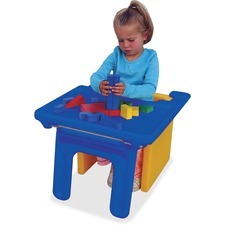 Childrens Factory Cube Chair Edutray - Rectangle - 26" x 21.13" x 16.4" - Plastic - Blue - Welcome to The Office City! This plastic tray rests onto the front of a Children's Factory cube chair (sold separately) to provide a play or eating surface close to the child. Legs fold flat for a convenient way to store the tray when not in use. Durable material can be easily wiped down to keep a sanitary environment. This plastic tray rests onto the front of a Children's Factory cube chair (sold separately) to provide a play or eating surface close to the child. Legs fold flat for a convenient way to store the tray when not in use. Durable material can be easily wiped down to keep a sanitary environment.